It’s October. That means, it’s also Dwarfism Awareness Month. Last year, I posted a collection of photos that demonstrated some of the issues I face on a day-to-day basis as a result of Pseudoachondroplasia, in an attempt to raise awareness of dwarfism (https://lifewithpseudoachondroplasia.wordpress.com/tag/dwarfism-awareness-month/). This year, I’ve decided to be a little more specific – to give an account of all of the physical ways that the condition affects my body… basically to explain how having pseudoachondroplasia doesn’t actually mean I’m ‘just a little bit short’! Before I begin, I ought to point out that what I’m going to explain is a) only the experience of Pseudoachondroplasia specifically, not an indication of what someone with any other of the 200+ types of dwarfism may experience, and that b) is my own personal experience of Pseudoachondroplasia – some of its traits vary from person to person, and like all my posts, this is just my understanding of the condition – not the understanding of a medical expert! Pseudoachondroplasia (PSACH) is described by the National Organisation for Rare Disorders as ‘a short-limbed dwarfing condition characterized by disproportionate short stature, joint laxity, attractive face and early onset osteoarthritis’. Whilst the most obvious trait noticed by others is my height (as a result of having arms and legs that are abnormally short in comparison to my body), living with the condition, there is a lot more to it. The most apparent thing being the differences in my joints. I’ve highlighted on a photo of me (a rare, full body length one! ), the joints which I find to be affected by the genetic condition and will explain in turn how they are affected. Shoulders: I have reduced joint rotation of my shoulders, meaning that reaching much above shoulder height has become impossible, and I experience a considerable amount of pain in these joints. Elbows: I don’t have complete extension in these joints, they also cause a fair amount of pain and often click too! Wrist and Fingers: The joints in my hands are particularly lax, meaning I have hyper-mobility in these joints and can bend my fingers much further back towards my hand than your average person. Again, these joints cause some pain (particularly if I’m using them for long periods of time, such as writing long documents). In addition, a trait of Pseudoachondroplasia is having ‘short and stubby’ fingers, on small hands. Yep, I have those too! 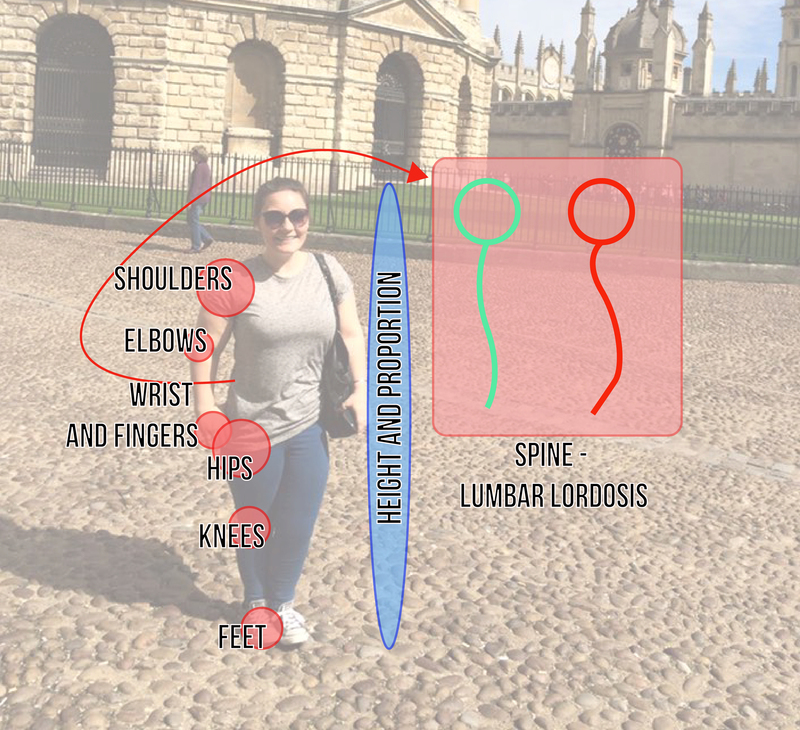 Hips: My hips are one of the two most troublesome joints in my body – thanks to the effect that pseudoachondroplasia has had on them (well, they were before I had them replaced!). Hip dysplasia is a common trait of the condition, and my poor excuse for a ball-and-socket hip joints had worn down to the point where they needed replacing at the age of 22. It was the best decision I have ever made and I love my new joints, but the originals really did cause some excruciating pain on a daily basis and stopped me from walking about for quite some time. Knees: Pseudoachondroplasia can cause knock-knees and bowed-knees in the people that it affects. For me, it’s knock-knees (or, genu valgum). This means that even when my feet are apart, my knees still touch. I’ve had numerous surgeries to try and correct this (which are documented in other blog posts), yet none of these have truly worked, because Pseudo-Knees are loose and are able to move sideways a little as well as how they should bend! They’re also quite painful, and are next on my ‘become a bionic woman’ joint replacement list. Replacements of knees and hips are common amongst people with this condition. Spine: I’ve poorly drawn the difference between an average spine and one affected by my condition. I have exaggerated lumbar lordosis (curvature of the lower portion of the spine), which unfortunately makes my stomach and bottom stick out more than they should. Obviously having an overly curved spine causes back pain, which can make standing for too long uncomfortable. Also! : In addition to the joints often being a different form, and causing pain, it’s worth noting (I think! ), that with this condition, a person has the ‘standard’ amount of muscle, just crammed into a smaller space (as a result of shorter arm and leg bones)… making limbs look quite bulky. That’s quite a frustrating aspect of the condition, as it can make limbs appear quite fat! So, yes, the condition physically affects much more about a person than just their height. The average male height is reported to be 3ft 11inches, with females measuring around 3ft 9inches. I actually stand at 4ft 9 inches, so a foot taller than average, but I still stand quite small in the average world. I’ve grown to accept that – but I have many years to come of dealing with the other traits of pseudoachondroplasia, and that is, the effects that the mutation in the COMP gene that causes my condition, has on my joints. ← What Not To Do? Assume. Thank you for that comprehensive breakdown. In addition I might add that I myself, am third generation. My grandmother, my mother and now myself (I chose not to have children by the way). Within our own family the differences in height is interesting. I don’t have the stats on my grandmother, however I stand at 4′ 2″ tall. In comparison my mother was nearly a foot shorter than I am. I had 2 cousins (1 male, 1 female) and 1 aunt. All of who were between my height and 4′ 8″ (the male). My mother was the only one in the lineage that stood at about 3′ 6″ (approximately). Pseudo height ranges are quite interesting. You are fortunate to have the kind of medical care now available. But we still have a long way to go. Thank you for your wonderful blog. Keep educating.